Despite significant shifts in the system of methods on tax evasion prevention (launching System of Value Added Tax Electronic Administration and Risk Assessment Monitoring System due to tax invoice registration), the expected reduction in the number of criminal proceedings on tax evasion has not occurred yet. At least, it is evidenced by the statistics. Thus, according to official statistics data, which is available on web-site of the General Prosecutor’s Office of Ukraine 292 criminal proceedings under Article 212 of the Criminal Code of Ukraine were registered upon results of the third quarter of 2018. 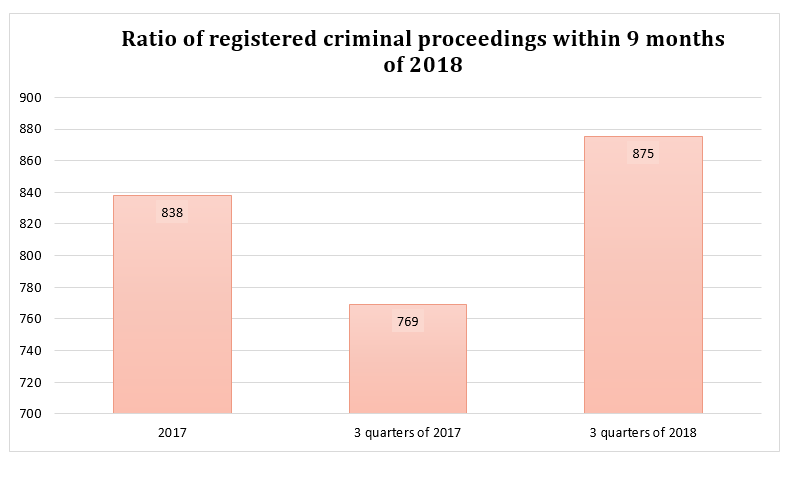 Thereby, the number of opened criminal proceedings in 2018 has reached 875 registered criminal proceedings and continues to increase. Comparing the present rates with the last year rates it can be said that in 2018 the statistical rates of tax militia work are already much higher. With regard to the closure of criminal proceedings, it’s not the first year when the sharp increase of the closed criminal proceedings is observed towards the end of the calendar year. According to our calculations and comparing with the first half year of 2018 only within the third quarter of 2018 the number of closed criminal proceedings has doubled – to 116 criminal proceedings. Herewith, the reasons of such trends are changeless and may be observed since 2015 – investigators use their efforts to “improve” personal statistics regarding unsolved crimes at the end of the year (please find newsletters “Criminal proceedings on tax evasion within 9 months of 2017: statistics, pace of consideration and verdicts”, “Criminal proceedings on tax evasion: summary statistics for 2017”). Therefore, as always, we are looking for substantial increase of rates regarding the closure of criminal proceedings in the final quarter of this year. It is obvious, that comparing with the same period of the last year, rates of the closed criminal proceedings within 9 months of 2018 are higher by 10%. 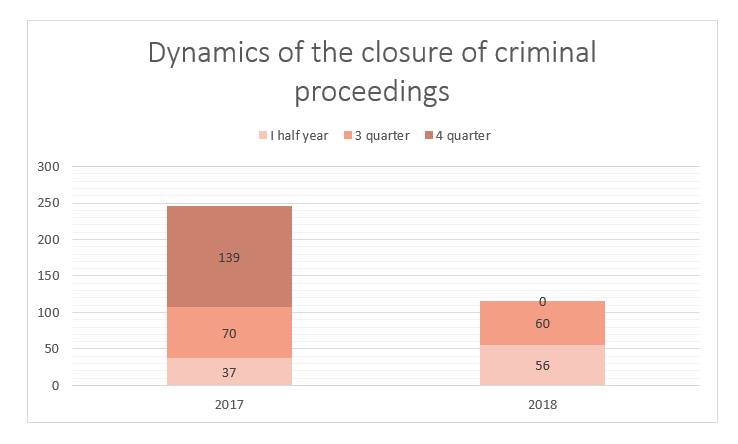 At the same time, the positive trend of increasing the number of closed criminal proceedings is apparently nullified by the similar increasing the number of opened criminal proceedings for the respective period (about 13,7%). In addition, we note, that according to data of the General Prosecutor’s Office of Ukraine almost absolute majority (98,2%) of criminal proceedings are being closed under para. 1-2 of part 1 of Article 284 of the Criminal Code of Ukraine, i.e. due to the absence of criminal event/elements of crime, the law, that cancels the criminal liability, which has come to the legal force, and verdict on the fact of committing the same act. It is understood that most of the criminal proceedings are still being closed particularly due to the absence of criminal event/elements of crime, stipulated by Article 212 of the Criminal Code of Ukraine. Therefore, effectiveness of criminal proceedings raises some doubts. With regard to the judicial consideration rates have caused some surprise. Thus, according to the Unified State Register of Court Decisions within the third quarter of 2018 there was only 1 (!) verdict under Article 212 of the Criminal Code of Ukraine. We assume, that this rate is determined by the court reform. 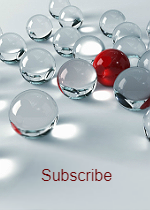 Probably, delays in consideration of cases are caused by transferring cases to a new autodistribution. Nevertheless, it is interesting, that such a single verdict is acquittal and contains a detailed analysis on act qualification. Thus, case No. 742/2412/17 was related to prosecution of the company’s director due to tax evasion by understatement of tax obligations on value added tax and forgery of tax reporting. The prosecution’s position was based solely on the fact, that the company had business relations with “sham” contractors, and director allegedly could know or even had known about “sham” nature of these contractors. That is why his actions were aimed at tax evasion in view of prosecution. 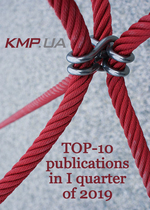 However, the Court has investigated the reality of transactions and pointed out, that the court ruling on exemption of the contractor’s director from criminal liability, which is contained in the court case materials, did not include any data on “unreality” of business transactions between the company and contractor. Herewith, the court pointed out the importance to adhere the principle of individual responsibility and mentioned, that establishment of the fact of the contractor’s sham business is not determined by the Tax code of Ukraine as an independent ground for depriving the right on tax credit and expense formation. Therefore, according to the data from the Unified State Register of Court Decisions within 9 months of 2018 there were delivered 16 verdicts, including 9 guilty verdicts, among which 5 verdicts on the basis of plea agreements and 7 acquittals. This rate is 74,5% lower, than that one in the same period of 2017. A detailed description of all court decisions is presented in the Annex. Summarizing the investigation of criminal proceedings on tax evasion, it is interesting to refer to the rates of reimbursement of losses incurred by the state due to the tax evasion. Thus, according to the announced statistical rates of the State Fiscal Service of Ukraine, losses amounting to more than UAH1 billion incurred by the state are caused to be reimbursed. At the same time, according to the data from the Unified State Register of Court Decisions, upon results of three quarters of 2018 the court has placed convicted persons under obligation to return founds in total amount of UAH 8 347 286 (without including the confiscated property) by delivering guilty verdicts. Whereas the total amount of losses (meaning the total amount of tax evasion in criminal proceedings) is UAH 44 355 458,81. It means that only 18% from actual losses incurred by the state due to the tax evasion are to be reimbursed by court decisions in criminal proceedings on tax evasion. It is obvious, that criminal proceedings under Article 212 of the Criminal Code of Ukraine are still meant to be more means of pressure, than the real method of struggling with tax evasion. 1Excluding tax evasion, determined by the court in 2017 in case regarding illegal use of customs processing regime – please find our newsletter “Criminal proceedings on tax evasion: summary statistics for 2017”.